All aerial classes are 75 minutes long. We begin with a warm up to get the blood moving, then move to the air, and end with some stretching and strength conditioning once we’re nice and warm! 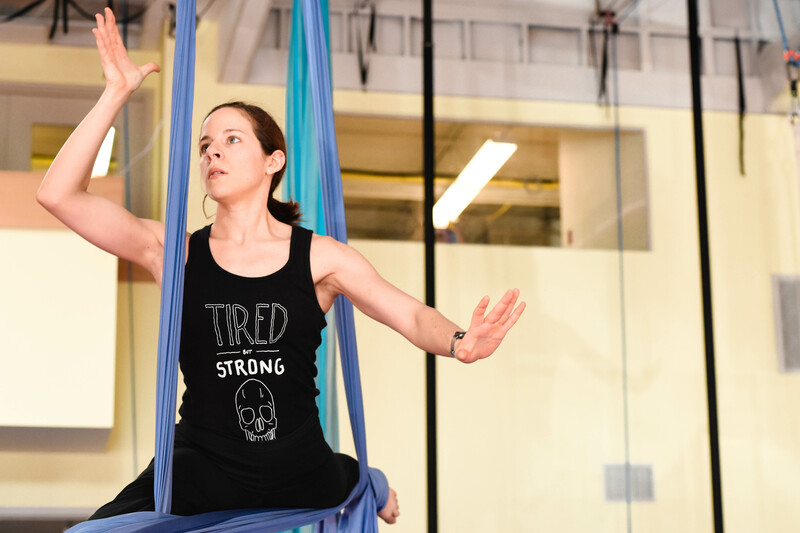 100 Level (Introductory): This level is for students who are brand new to aerials, or who are still working on getting comfortable with aerial equipment. Students in this level may not yet be able to climb the fabric or invert on the apparatus without significant help from the instructor. 100 Level classes are for gaining familiarity and comfort with aerial equipment, and learning how your body works in space. 150 Level (Beginner): This level is for students who are able to climb the fabrics andperform foot locks either on the ground or from a climb. 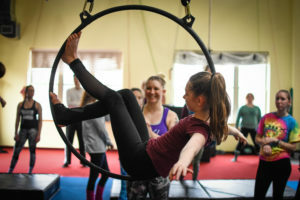 Lyra/trapeze students should be comfortable with knee hangs, sitting based poses and inverting from the ground without instructor’s assistance, but with the aid of jumping or their feet if necessary. 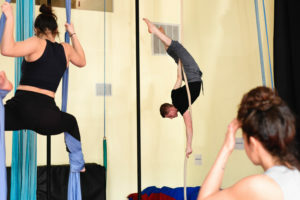 Students in this level have either completed level 100 at ATA, or have had basic instruction elsewhere, and have the basic body strength necessary for aerial arts. 150 level classes are for learning more complex poses, learning to invert on the fabric, and learning ‘core’ principles of aerial work. 200 Level (Intermediate): This level is for students who are comfortable inverting with minimal ‘cheating’. Fabric students should be comfortable with climbing, performing footlock from several climbs, and climbing into a hip key from a same side knee hook. 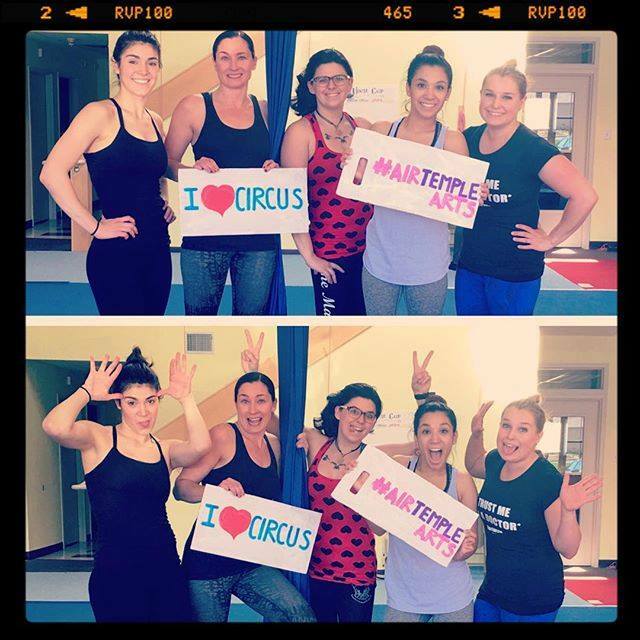 Trapeze students should be comfortable with knee hang beats and forward rolls. 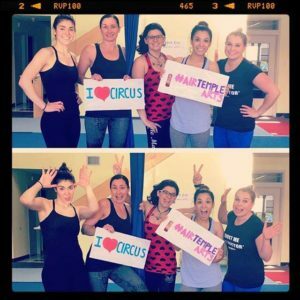 200 level classes are for learning to invert comfortably in the air, building stamina, as well as basic dives and rolls. 300 Level (Intermediate/Advanced): This level is for students who are comfortable with being in the air and performing short sequences easily. Students should need no assistance to invert in the air, and should be familiar with with drops and dynamic movements. 300 level classes are for learning to create choreography, learning complex drops and sequences, and building greater strength, stamina and flexibility. This level is for advanced students looking to hone their craft. In this level we will be working on new and exiting drops, complex sequences, a-typical entries for skill we already know. We’ll be working to gain a greater understanding of why fabric works the way it does so in order to build towards greater (and safe) creative freedom.